Today was a lazy day. I did manage to get outside for a quick run, but otherwise my day consisted of sleeping in until nine (which is crazy late considering I am up at five for work), watching the Today Show, playing on Pinterest, doing some laundry, and watching NBC’s “What We Wasted Our Year On.” For dinner I roasted a bunch of vegetables and tossed them with Lemon Garlic Orzo and a simple lemon dressing. This dish made my day feel accomplished. It was fresh and satisfying. I suggest a colorful combination of vegetables below, substitute with whatever vegetables you have at home. Artichokes or sun-dried tomatoes would be yummy too! Tomorrow I am going to play in the kitchen some more. I’ll be making stuffed mushrooms and experimenting with Jalapeño Cheddar Scones. Preheat oven to 400 degrees. Spread the vegetables on a baking sheet. Drizzle with extra virgin olive oil, salt and pepper. Roast the vegetables for 25 minutes. As the vegetables are roasting, bring a pot of water to boil. Cook pasta according to package directions. Drain and return to pot. To prepare the dressing, combine the olive oil, lemon juice, salt and pepper. Whisk. 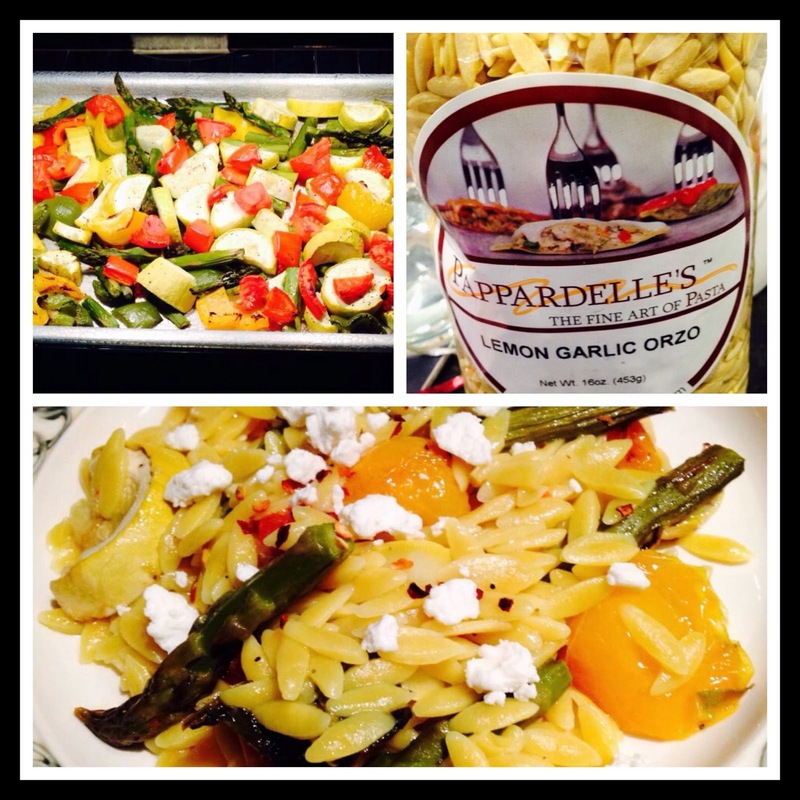 When the vegetables are ready, toss them with the pasta, and mix in the dressing. Top with red pepper flakes and feta cheese. Mary Ann and I visited the Brentwood Farmer’s Market this afternoon in search of fresh ingredients for our Sunday night dinner. We had fun sampling foods, people watching and picking out produce. An hour later we left the market with heirloom tomatoes, wild arugula, baby kale, basil, apple cinnamon goats cheese, raspberry honey, berries, and almonds! 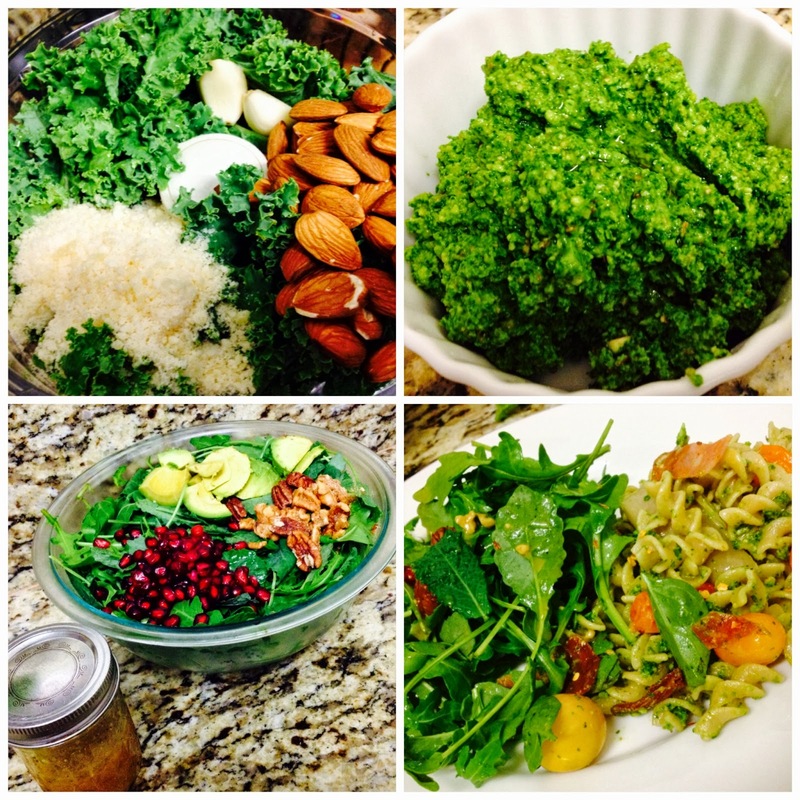 I played chopped with produce left in my fridge and made a Tuscan kale almond pesto. I roasted the heirloom tomatoes and some purple peppers with some extra virgin olive oil and garlic salt, and cut up some calabrese salami. I tossed rotini pasta with the pesto, tomatoes, peppers, basil and salami and topped it with red pepper flakes. As a side dish I made a baby kale and arugula salad with some avocado, candied walnuts, pomegranate seeds and my champagne vinaigrette. While the tomatoes and peppers were roasting, and the pasta was cooking we snacked on an appetizer of whole grain bread with the apple cinnamon goats cheese and a drizzle of honey. The colors on our plates were beautiful! I was skeptical of kale almond pesto because of how much I love basil, but it was fresh, nutritious and had a beautiful bright green color! Tonight’s meal was a great celebration of the produce of California! In a food processor, combine the garlic, almonds and pulse to chop. Add the kale, parmesan, red pepper flakes, water, lime juice, 1/2 tsp. each salt and pepper and pulse to combine. Turn the processor on and drizzle in the extra virgin olive oil until you get your ideal consistency. Taste and adjust seasoning/add more kale leaves as needed. It’s carbo-loading time! San Diego Rock n’ Roll Marathon is on Sunday! Ahh! I am officially freaking out. The only thing left to do is sit as much as possible, sleep at least eight hours a night, and eat pasta, my favorite food. Send Carmen, Marta and I good luck vibes Sunday morning. We’re starting at 6:15. Here’s to hoping we don’t hit the dreaded wall and end with smiles! Cook the pasta according to the package directions. Reserve ½ cup of the cooking water, drain the pasta, and return it to the pot. Add the mushrooms and onion and cook, tossing occasionally, until the mushrooms begin to release their juices, 2 to 3 minutes. Add the wine, ½ teaspoon salt, and ¼ teaspoon pepper and cook until the mushrooms begin to brown, 5 to 6 minutes. 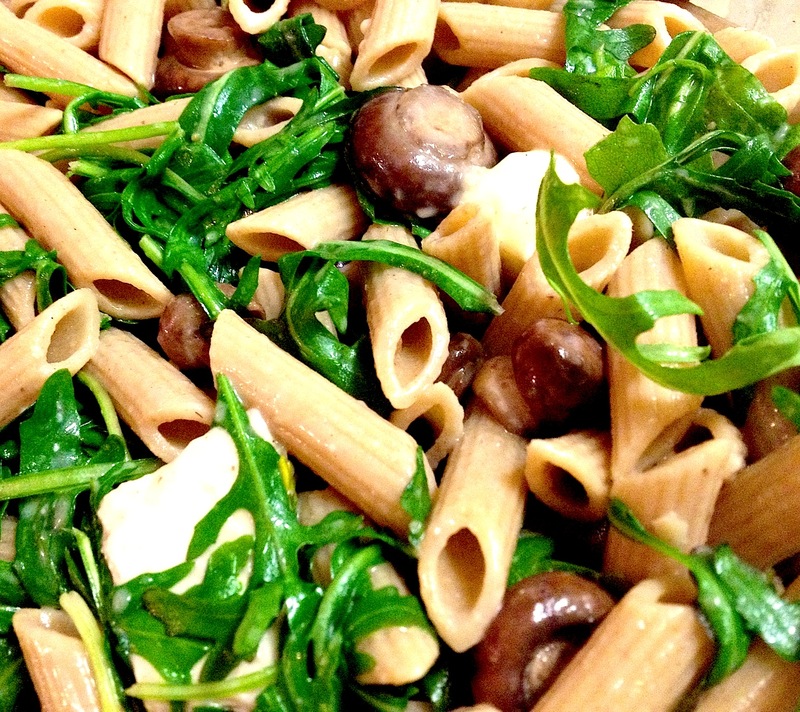 Toss the pasta with the Brie and reserved cooking water until the pasta is coated. 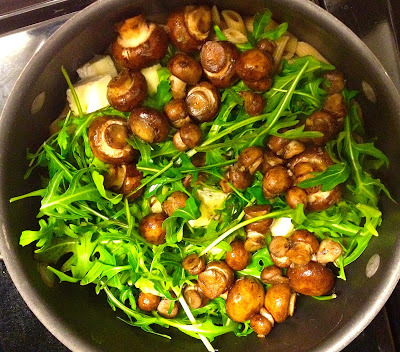 Stir in the mushroom mixture and arugula.